PITTSBURGH The Pittsburgh Steelers escaped with a victory. The health of their franchise quarterback is another matter entirely. The Steelers edged the woeful Kansas City Chiefs, 16-13, in overtime on Monday night but lost Ben Roethlisberger for most of the second half -- and perhaps a lot longer -- with a right shoulder injury. Roethlisberger left early in the third quarter after getting slammed to the turf by Kansas City linebackers Tamba Hali and Justin Houston. Coach Mike Tomlin said he was taken to a hospital for evaluation. The Steelers (6-3) went on to their fourth consecutive victory. Shaun Suisham kicked a 23-yard field goal 51 seconds into the extra period, one play after Lawrence Timmons intercepted Kansas City's Matt Cassel and returned it to the 5 yard line. Jamaal Charles ran for 100 yards and a score for the Chiefs (1-8), who have lost six straight. The Chiefs rallied in spite of themselves in the final 2 minutes. Cassel led Kansas City 52 yards, converting a 4th-and-15 in the process, to set up a 46-yard field goal by Ryan Succop as time expired. Kansas City's only other victory this season came in overtime, a stunning upset in New Orleans in September. Any chance at a repeat faded when Cassel's pass on the second play of extra period landed in the hands of Timmons, who returned it 23 yards to set up Suisham's second game-winning field goal of the season. The victory, however, came at a high cost. Roethlisberger is in the midst of a career year but struggled through a so-so first half and was 9-of-18 for 84 yards and a touchdown when Hali came down on top of him while taking a sack on Pittsburgh's first possession of the second half. Byron Leftwich, playing for the first time in two years, was rusty in relief. He completed 7 of 14 passes for 73 yards, though he did produce a scoring drive early in the third quarter that gave the Steelers a 13-10 lead. It nearly held up on a night the Chiefs had one touchdown called back due to a penalty and another overturned on replay. Cassel completed 11 of 26 passes for 154 yards for Kansas City. But the team ranked last in the NFL in turnover margin saved its biggest mistake for overtime. Pittsburgh came in riding a three-game winning streak that erased the sour taste of a 2-3 start, and the Steelers insisted all week they wouldn't look past the Chiefs toward a showdown against rival Baltimore next Sunday. Funny: Pittsburgh certainly looked distracted at the start of a raw, soggy night at Heinz Field. The Chiefs didn't take long to erase one bit of misery in their lifeless, luckless season, taking their first lead since New Year's Day during a spirited first half in which they avoided the kind of gaffes -- turnovers, penalties, assignment breakdowns -- that have plagued them all year. 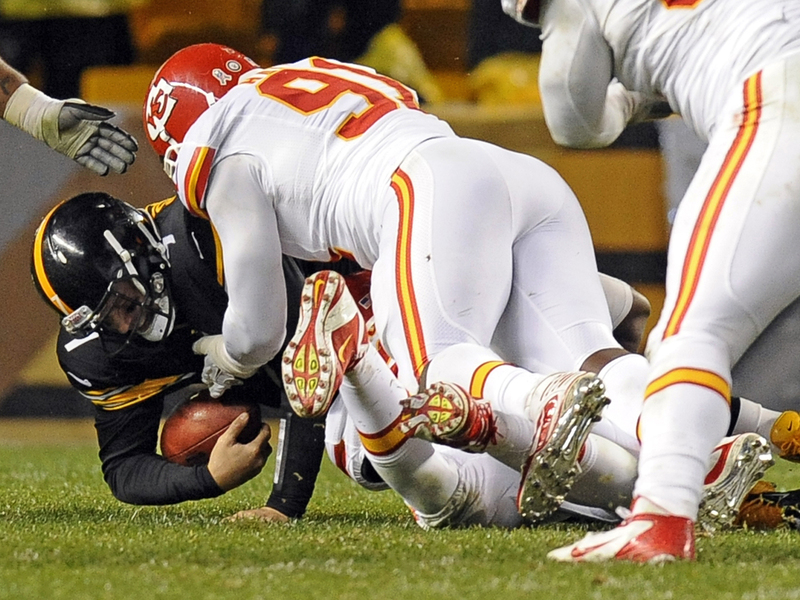 With Charles gashing Pittsburgh's defensive line and Cassel avoiding mistakes, Kansas City raced in front 10-0. Cassel hit Tony Moeaki for 38 yards on the Chiefs' second drive, setting up a 12-yard touchdown run by Charles to give Kansas City its first lead since a 7-3 victory over Denver in the 2011 regular-season finale. The lead grew to 10-0 after an Isaac Redman fumble deep in Pittsburgh territory led to a 22-yard field goal by Succop. Like any brief flirtation with success for Kansas City, it didn't last. The Steelers drew even before halftime. Working almost exclusively with his tight ends, Roethlisberger drove Pittsburgh to a 35-yard field goal by Suisham and tied it on Pittsburgh's next possession, when Mike Wallace atoned for an earlier drop by making a remarkable 7-yard touchdown grab in the corner of the end zone. The ball slid through Wallace's hands, but he secured it with his legs, and controlled it, before rolling out of bounds. There would be no second-half carryover, however. Whatever momentum the Steelers had vanished the second Roethlisberger trudged to the sideline holding his right shoulder. In that moment, all the chatter about Kansas City's visit and former Chiefs coach-turned-Pittsburgh-offensive coordinator Todd Haley's shot at revenge vanished.